Singham Returns ended as 4th Highest opening day of All Time. Singham Returns is the highest opener of 2014 beating Kick. Singham Returns is also the highest opening day collections ever for Ajay Devgn. In comparison when the original Singham had opened it had only a 9 Crore opening day. Singham returns has opened to bumper start across single screens while multiplexes are also good. Singham returns is set to open in 4000 Screens across India Today. Original Singham did best in Mumbai Circuit ( Maharasthra, Gujarat etc ) which is always the highest contributor to all India collections due to highest ticket prices but didn’t do as well in North ( Delhi , Punjab) which is the second highest contributor. 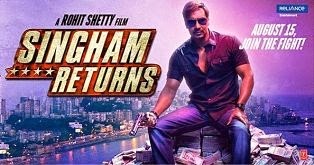 Singham returns will be again strong in Mumbai Circuit but this time but this time North also look better due to holiday.